Brinks has always been one of the most widely recognized brands in its market space, known for their dedication to security and protection. Brinks Home Security was recently ranked #1 in Customer Satisfaction with Home Security Systems by J.D. Power, and with over 1 million subscribers, Brinks is one of the largest and most trusted home and commercial security companies in the U.S.
Brink’s takes its commitment to provide powerful and reliable home security, with fast 24/7 alarm response, seriously. As an industry leader who believes mobile technology is the fastest way to connect with loved ones in an emergency, it makes sense that Brinks identified text messaging as a more effective way for customers to engage with them. The company turned to Quiq and its multi-channel messaging platform for a new and more efficient way for their customers to connect with the company and its contact center for all types of assistance. Brinks has deployed Quiq’s inbound SMS/text messaging, outbound text notifications, and web chat. Q: What motivated Brinks to look at messaging as a way to connect with customers? A: More than 90% of all of our transactions were phone-based. Taking time to make a phone call was a rigid, inflexible pain point for our customers. We wanted to provide a channel that put the format back in the customer’s control. Unlike phone calls, customers and agents are able to exchange and share attachments, links, gifs, and emojis making the interaction context rich. These rich messaging interactions help agents understand the question faster and thus ensure customers quickly receive the help they need to resolve their inquiry and get on with their day. Messaging has dramatically and positively impacted the contact center. The first thing to note was the fairly immediate shift of 10% of phone calls to messaging. There is also a significant difference in agent productivity. With phone calls, agents can only handle 1 at a time, but with text messaging, the agents handle from 4-6 unique conversations at a time. Even with an increase in the number of conversations each agent has, there has still been a 14 ppt.(avg.) uptick in CSAT. In fact, Brinks is watching the satisfaction rate with text messaging continue to climb, all while seeing staffing savings. After extensive call type and touch point analysis, Brinks launched Quiq Messaging as Brinks Home Security Text in January 2018. This strategic move to engage with their connected customers put the “when” and “how” of customer communication back in their customers hands. Converting 10% of their inbound phone-based customer contact to a digital messaging experience in 5 short months, the company saw a noticeable difference in how customers and agents interact. Messaging allows customers to have conversations at their desired pace, while enjoying an experience that is as familiar as texting with family and friends. 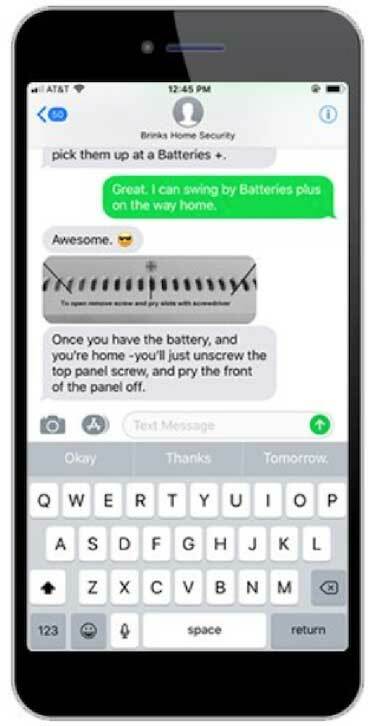 Brinks proactively promotes and encourages their customers to engage with them via text messaging. 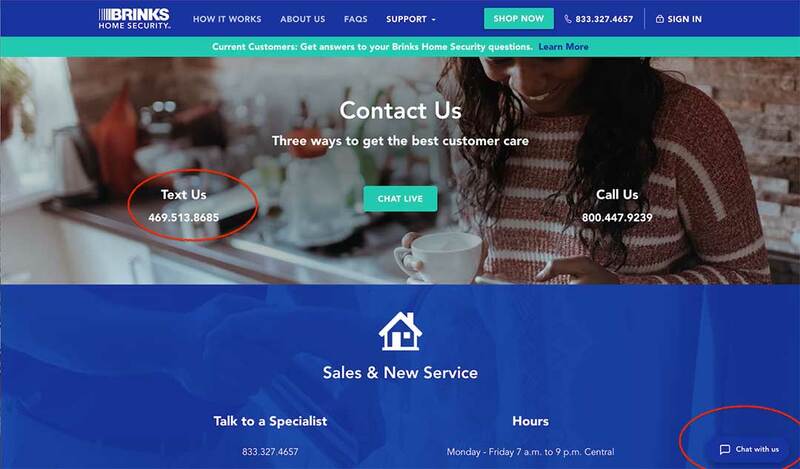 Visitors to brinkshome.comare able to initiate a conversation with an agent through a “Text Us” link displayed prominently above the fold under “Contact Us”. Website visitors may also choose to engage by clicking the “Chat with us” icon on the lower right hand side of the screen displayed on every page. What Brinks discovered as a result of implementing Quiq Messaging was a reality that was a very pleasing contradiction to those beliefs. Across their customer segments, text has continued to ramp, regardless of age-related demographics. In fact, the slowest month-over-month growth for the messaging channel has been a 135% increase, with the highest monthly increase at 329%. Not only has the messaging channel proven to be a preferred method of engagement, but agents handling the exact same contact types on the messaging channel as they did with phone with a higher average CSAT score. Q: Based on your experience with messaging, what are some key takeaways you would share with CX leaders who are considering opening the messaging channel? A: One of the biggest lessons learned from the messaging channel has been promoting the channel. It is important to leverage every engagement or touch point to help build awareness and grow a new channel. That may mean promoting it via social media, outbound emails, newsletters, on the primary website, mobile website, and even in your IVR messaging. Just letting customers, who are calling in, know that they can hang up and text your brand directly will immediately shift calls to text messaging. When promoting the messaging channel, Brinks also recommends that companies alter their campaign approach monthly, starting with awareness, next adoption, and finally growth. However, the most important thing to do is to avoid letting assumptions prevent success and to lean on your Voice Of Customer (VOC) data to drive you. In an effort to measure and continually improve on the digital experience, Brinks built out a short survey and implemented it by automatically sending a link at the close of each text message conversation. The survey questions emulate the main questions used to calculate customer satisfaction rates (CSAT) and Net Promoter Score (NPS). Issuing a satisfaction survey via text instantly yielded a 10% completion rate, which is a 60% increase over surveys delivered over traditional channels. A smooth implementation of Quiq’s Messaging platform set the stage for the high adoption rate of messaging among agents and customers. Brinks has been pleased with how quickly their customers has embraced the messaging channel. The company plans to continue promoting the channel so that at least 20% of their interactions are over messaging or web chat, as well completing Quiq’s integration into Brinks’ IVR system, as well as introducing automated SMS notifications for service updates. The company had originally planned to hit that 20% target in 12-18 months, but with the rapid acceptance and use of messaging by their customers, Brinks expects to hit that goal much sooner than expected.